Located some 400 kilometers from Zhaoxing Dong Minority Village, Fanjing Mountain is a national nature reserve as well as a sacred Buddhist place. Who visits: Photographers, Nature Lovers, Hikers, Buddhist Culture Scholars and Buddhism pilgrims, Adventure Enthusiasts! With a history of more than 2,000 years, the famous cultural mountain - Fanjing Mountain stands in Dongren (铜仁). It offers Red Cloud Golden Peak (红云金顶), Yuejing Mountain (月镜山), Ten-Thousand Sleeping Buddha (万米睡佛, Fanjing Mountain looks like a sleeping Buddha in the disatance), Mushroom Stone (蘑菇石), Jiulong Pond (九龙池), Fenghuang Mountain (凤凰山), Numerous Rolls of Books (万卷经书) and so on. 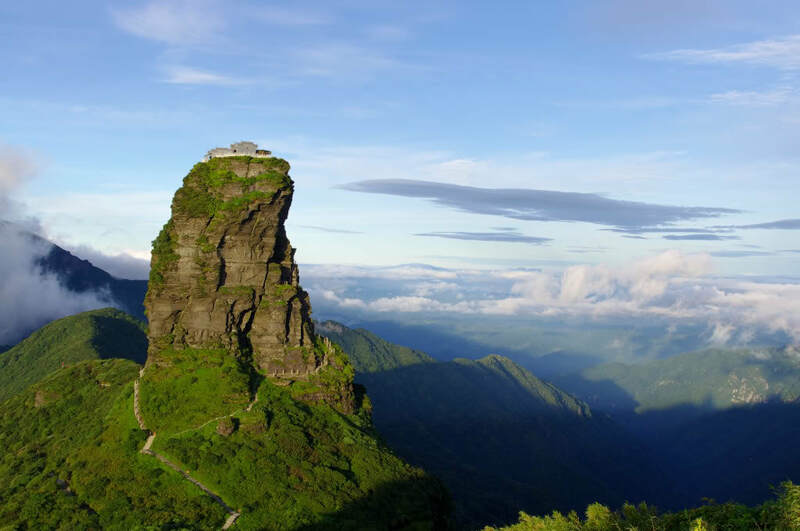 The Red Cloud Golden Peak has a height of 94 meters and a diameter of 40 meters. On the top of Red Cloud Golden Peak stand two temples which were originally built in the Ming Dynasty (1366 - 1644). The left one is called Sakyamuni Temple and the right one is called Maitreya Temple. A bridge flies across the channel between the two temples. A valley is more than 1,000 meters below the temples. In addition, many Buddhist buildings were built in the quiet and holly Fanjing Mountain. Reeves’s Pheasant and the like. As Tujia, Miao, Dong, Han and Qiang People have lived at the foot of Fanjing Mountain, visitors also can explore their culture and customs there. If you are planning to visit Fanjing Mountain for photography purposes, the best time to visit is the early morning after rain. Generally speaking, clouds, Zen Fog, Buddha Light and amazing sunrise will appear after rain. There are 8 tourist shuttle buses from/to Tongren to/from Fanjing Mountain. The first shuttle runs at 08:00 am every morning. It runs every 2 hours. If you are not in Guizhou Province, there are a few options. Rent a vehicle departing from your departure point. This is the quickest and most direct option. You can take a direct train to Tongren from Shanghai, Hangzhou, Ningbo, Guilin, Changsha, Guanghou, Chengdu, and Chongqing. Then, take the tourist shuttle bus to Fanjing Moutain. You can take a direct bus from Changsha, Zhangjiajie, Changde, and Fenghuang to Tongren. Then, take the tourist shuttle bus to Fanjing Moutain. There are 8,000 steps to the top. It is very challenging to climb up to the top. It takes an adult in good condition 4 hours to climb up to the top. It is suggested that you take a cable uphill. When getting off the cable, it also takes you 30 minutes to hike up to the top. As there is much fog on the mountain, it is recommended that you wear comfortable hiking shoes. There is large temperature difference between the morning and the evening there. It always rains thunder shower. You’d better take a raincoat or an umbrella with you. Wear the sunscreen cream to protect your skin. Bring a mountaineering stick, antiphlogistic drug and a flashlight with you. If it rains thunder shower when you climb the mountain, please do not stay on the top of the mountain and keep away from the cliffside. The mountain gate is open to visitors at 06:00am. And the cable is open to visitors at 07:00am. There is no any accommodation on the mountain while there are several accommodations outside the mountain gate. If you would like to enjoy the sunrise and clouds on the top of the mountain, you’d better get up very early and climb up to the top. As at 21st June 2018, entrance pricing is 110 CNY per adult during the peak season and 90 CNY per adult during the off season ( from December 1 to the end February); children under 1.1m (1.1m not included) and the elder above 70 years old (70 years old included) are free of charge; 55 CNY per person is for children between 1.1 m (1.1m included) and 1.4m (1.4m not include) and the elder between 60 years old (60 years old included) and 70 years old (70 years old not included). The pricing for the round-trip shuttle bus for an adult is 20 CNY; The pricing for the round-trip shuttle bus for children between 1.1 m (1.1m included) and 1.4m (1.4m not include) is 10 CNY; The pricing for the round-trip shuttle bus for children under 1.1m (1.1m not included) is free. The pricing for the round-trip cable for an adult is 160 CNY; the pricing for the uphill cable for an adult is 90 CNY; the pricing for the downhill cable for an adult is 90 CNY; the pricing for the cable for children under 1.1m (1.1m not included) is free. Interested in visiting Fanjing Mountain on a Tour? Wendy Wei Tours offers a variety of different packaged tours as well as custom tours including Fanjing Mountain, among other attractions and destinations. To find out more, please visit our Tours page or Contact Us directly to find out more.